Given the choice, I'd choose thrift or consignment shops over malls any time. I never know what little treasure I will unearth on the day. Nothing makes my heart palpitate a quicker than getting a bargain on a pair of shoes or a vintage handbag. Over the years, I've picked up vintage Hermes bags, Chanel jackets and shoes at basement bargain prices. I've got a self diagnosed affliction called shoe addiction. My only problem is my size 34 feet. They're even smaller than my mom's which is abnormal if you ask me considering that I'm actually taller. No wonder I have zero balance and is as clumsy as my youngest brother who is well known for tripping over his own toes. 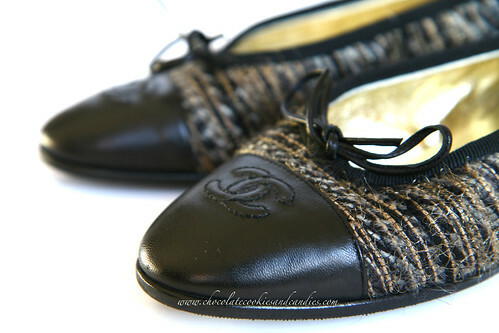 These Chanel ballet flats in tweed are my latest find. 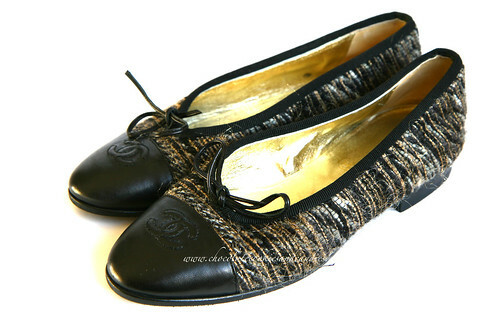 Why am I waxing lyrical over these shoes? Well, because they're Chanels <- she utters with such reverence. I've approached Chanel in London to ask if they could order my size in. "Sorry Madam, we apologize for the inconvenience but we simply can't order anything smaller than a size 36". On my last trip to Hong Kong, the Chanel store at the airport told me they're able to do a nationwide search for my size but unfortunately, they can't ship overseas. Well, that killed my dream. Imagine my delight when I found these in MY size and for a quarter of the retail price. Do tell! I bet you're really good at putting additional insoles to make the size 36 shoes fit. Thank you for your comment, Black is the New Black! I haven't seen these before but I love that it's in a neutral shade. Fingers crossed my scotchgard spray works. It has been raining all week. Well, I actually bought most of my shoes online coz I NEED the size 35. Additional insoles only help when it comes to boots/booties (in size 36). LOL. Great minds think alike. Most of my shoes are online purchases. Tod's at Bicester Village sometimes stock size 34/35. I was lucky enough to pick up a brand new Tod's loafer at a charity store for £35 in my size. Those flats are gorgeous! Great find! Thank you, Steph! I was thrilled to find a Chanel anything in my size. Cecilia, you're a sweetheart! I'll keep that in mind. I can't begin to tell you how impossibly difficult it is to find shoes in my size. Every year, I spend a fortune to resole my shoes just to make sure that they last as replacing them is a painful process.